INDIANAPOLIS -- The Indiana University-Purdue University Indianapolis Graduate Office is hosting its annual Graduate Expo from 10 a.m. to 2 p.m. Thursday, Sept. 22. The expo is open to anyone who wants to learn about graduate school options. Prospective students are encouraged to drop in anytime during the four-hour time frame. 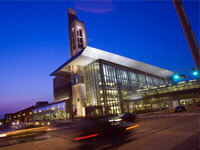 The event will take place at the IUPUI Campus Center, 420 University Blvd. Representatives from more than 20 IUPUI graduate and professional programs, as well as from more than 40 other universities, will be on hand in a fair-type atmosphere to talk with and provide information to people considering graduate school. The expo also features three breakout sessions: GRE Test Preparation, Funding Graduate School and Writing a Personal Statement. The event is free, and online registration is encouraged. For more information and a list of participating IUPUI departments and outside universities, visit IUPUI's Graduate Office website.